Quality trumps quantity. Develop a concept rather than simply publish for the sake of it. Four primary tasks in creating a blog entry include: researching a concept, sharing your insight, writing the content, and designing a smart graphic. Strive for compelling content. Your time is valuable. Blogging might be inexpensive, but it is time-consuming. At least consider your time spent on blogging in terms of a ROI and if it brings you happiness. Your audience is bombarded with content on a daily basis. Build up anticipation. Get your audience excited to read your latest insight on a particular day every week. Keep the blog short because your readers have a short attention span. In my opinion, a blog with one paragraph and without any references or stats is an immediate turnoff. Wouldn’t you rather read something of substance? I think a comfortable medium is between 400 to 800 words. To grab my readers’ attention, I always include visual content. To show I did some homework, I guarantee at least one quote. “Broadcasting instead of engaging is not an acceptable trap to fall into.”[ii] I understand why you want to tame your promotions when you are selling something, however, what about when you are giving away something for free? You are essentially giving away your concept and hard work. At a minimum, you want for it to be read by audience. There will always be some element of broadcasting. “Your network is your net worth and your greatest career asset.”[iii] For the vast majority of your connections, there is no real deep, personal relationship; in other words, you cannot have a meaningful, interactive and personal exchange with thousands of connections. You can do it with a cadre of a few hundred people you know. But for the rest, making connections involves formal and informal reputation management – personal branding and gossiping, respectively. Obviously, you must commit to responding to comments and requests and remain authentic – the size and scope of your audience fuels your influence. If you can spare five to ten hours a week, like the challenge of being insightful and have basic writing skills, you should consider blogging as a part of your online personal brand. You might take on a ‘thought role’. Effective blogging reinforces each element of my online personal brand model: validates your skill set, radiates your aura (by sharing your personality), and establishes an identity (by helping you ‘get found’ on networks). [i] Miriam Salpeter (2011). Social Networking For Career Success. New York: Learning Express. [ii] Ted Coine and Mark Babbitt (2014). A World Gone Social: How Companies Must Adapt To Survive. New York: AMACOM. [iii] Dan Schawbel (2013). Promote Yourself: The New Rules For Career Success. New York: St. Martin’s Press. 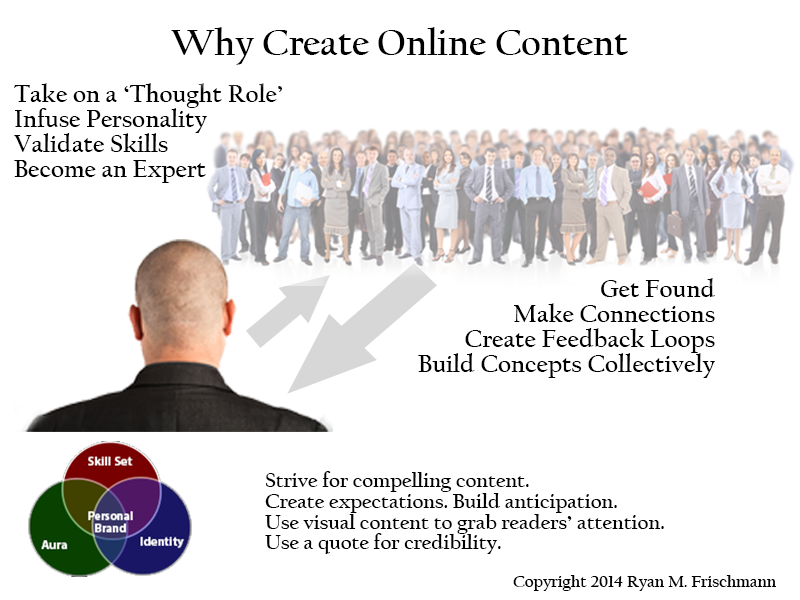 Author TheProfessionalWebsitePosted on December 17, 2014 December 18, 2014 Categories Personal BrandingTags Career Success, Miriam Salpeter, Social Networking, thought roles1 Comment on Why Create Content?